Salmon are not native to the Great Lakes. They were introduced from the Pacific Ocean in the late ’60s and quickly became the most popular sport fish in the region. Dramatic changes in the food web in Lake Huron caused by too many salmon and other exotic species like invasive mussels brought about the demise of the fishery around 2003. That has been a huge economic blow to tourist towns along the coast but state officials say there’s nothing they can do to bring it back at this point. One place the state hopes to keep a decent sport fishery for kings is in the Cheboygan River. Todd Grischke manages Lake Huron for the Department of Natural Resources. He says there might be more food for salmon out in the Straits of Mackinac. But while Lake Huron is seeing the continuing collapse of its salmon fishery, it’s shaping up to be a banner year for salmon fishing in Lake Michigan. Anglers are catching more big fish – a sign that there is more food for the salmon in the lake this year. Boat launches on Betsie Bay, in Benzie County, are full of empty trailers; anglers are standing side-by-side on bridges over the Betsie River; and bait shops are bustling. 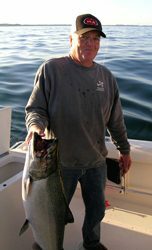 Jerry Kekal works at the Frankfort Tackle Box. He’s looking at the results from this year’s Benzie Frenzy fishing tournament. That’s just the kind of year it’s been. Dave Clapp is the manager at the Charlevoix Fisheries Research Station for the DNR. They keep track of fish caught in Lake Michigan. Clapp says the bigger fish in Lake Michigan are thanks to a strong alewife hatch in 2010. Alewives are an invasive fish that salmon like to eat. Until this summer alewife numbers had been on the decline. Those big salmon being caught now, they have been feeding on that strong class of alewives since last fall. Clapp says the size and health of salmon are closely tied to the alewife population. And he says it’s difficult to predict when another strong alewife year will come around again. What helps set this year apart is how bad the fishing was for most people last year. According to the DNR, 2010 was the lowest harvest of Chinook and Coho from Lake Michigan in the last decade. So as word spread of the numbers and size of fish being caught this year, anglers from around the state have been heading north. Mike Henry is up from Waterford. He came north with some friends after hearing from his boss how good the fishing is this year. Mike doesn’t consider himself to be a serious fisherman, but his boss gave him some advice that makes catching salmon on the Betsie River sound easy. As far as totals for the year, the DNR still has employees, creel clerks, they’re called, visiting boat launches and counting the salmon coming in. And though it may turn out to be a good year for salmon fishing on Lake Michigan, experts who watch the fishery closely say what’s happening on Lake Huron could be a warning of what might happen throughout the Great Lakes. For the Environment Report, I’m Tom Kramer in Benzie County.